For example, if a player on theopposing team is injured and they are playing short, take off a player as well. If a team is short players, match their amount of players on the field. This will ensure fair play and good sportsmanship among all players. If a parent enters the field of play without explicit permission of the referee the game will be abandoned immediately and the team will receive an automatic loss. Provide a safe and fun playing environment. Do not allow and bullying or foul language on the field. Allow do-overs to contribute to the player's/team's soccer development. Adjust number of players on the field if needed to improve playing experience. 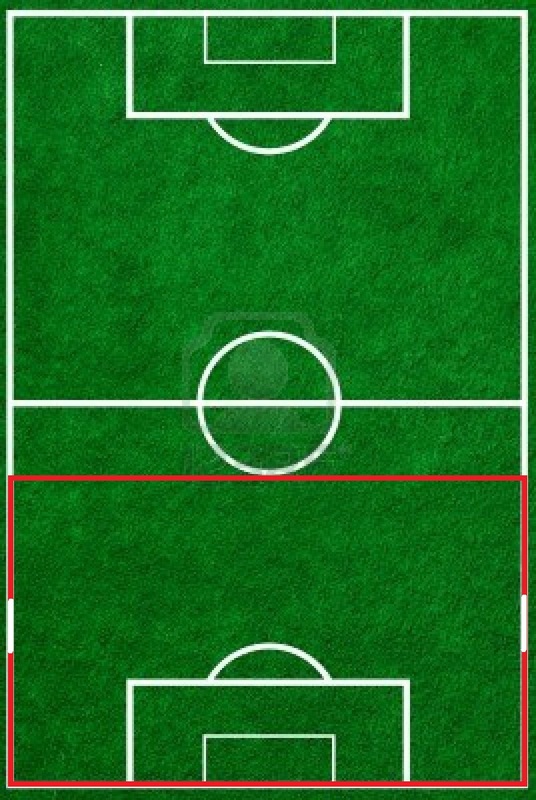 Dimensions: The field of play must be rectangular, field ratio of 7:5. A maximim of 3 fields will fit on an 11v11 field. The length will stay the same, but width will change to 35 meters. The goal area is 8 meters in length. The width is the goal plus 5 meters an each side of the goal posts. The penalty mark is 8 meters from the goal. Portable 7v7 goals will be used. If a team has no substitutions the format will be changed to 6v6. Games will be forfeited if a team has 5 players or less. A scrimmage will be played instead of the game. The team that has the sufficient amount of players will receive an automatic 3-0 win. Goalie substitution can only take place during stoppage of play and after consent of the referee. Games are 2x25 minutes long, this includes half time. - The ball can be kicked in from the ground or hands. If a goalie catches the ball and puts the ball on the ground to continue the play, it is interperted as a goalkick. The ball cannot be recovered from the goalie until it has been kicked. - Corners can be taken 25 meters from the goal post. - The goalie is allowed pick up the ball after a pass or throw from a teammate. - Goal kicks can be kicked in from the ground or from the goalie's hands. If a goalie catches the ball and puts the ball on the ground to continue the play, it is interperted as a goalkick. The ball cannot be recovered from the goalie until it has been kicked. The maximum allowable goal difference is 5. Goals will not be registered if the goal difference is bigger. If a team is losing with 5 goals or more, the winning team has to play one player down, until the score is equalized. - A player commits a slide tackle and touches another player (even when the player touches the ball). - The opponents of the team taking the free kick are at least 5 meters from the ball until the ball is in play. - The penalty mark is 8 meters away from the goal.